Germany’s overwhelming win over Australia last night was really sweet, especially because it was seen in person by myself. 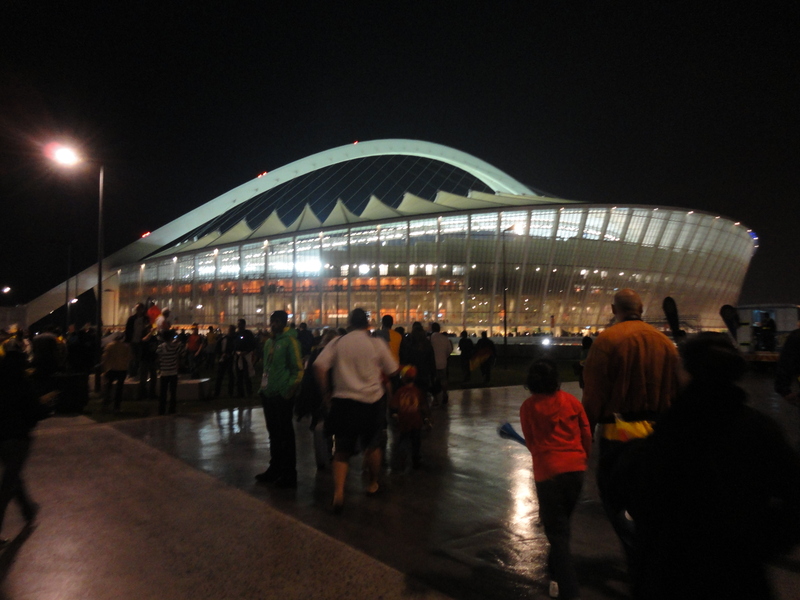 I went to my first World Cup game at Durban’s Moses Mabhida Stadium for what turned out to be a fine night. Getting in was smooth, though for the entrance into the stadium grounds there basically was no line, just a huge crush of people slowly but surely moving forward, the stadium looked great, and the view from my seat high up in the highest sections was good. Scoring their first goal within the first 10 minutes, Germany didn’t look back at all and kept up the pace, scoring twice in the first and second halves. And it would have been more if they hadn’t muffed a few good chances. Not to say Australia wasn’t game and didn’t press hard, but they were just out of it almost from the start and they even lost a player early in the second half to a red card so they had to play a man down for the rest of the game. Getting into and out of the stadium was alright as security was tight and there was basically no rowdiness to be found. Even after their crushing defeat, Australians just streamed out without any rancor and the Germans were happy but not excessive. On the other hand, while the fans didn’t indulge in any rowdiness, the police and hundreds of stadium stewards decided to make up for this by starting some action of their own several hours after the match. A strike by stewards over being paid much less than allegedly promised was broken up by the police that saw several injuries and involved rubber bullets being fired. An earlier story from the same paper is here. It’s unfortunate something like this had to happen. R190 (about US$26) is not a proper day’s pay especially from a body as wealthy like FIFA or a FIFA contractor. It is good that this happened hours after fans and players had left the stadium otherwise it could have been a bigger disaster.